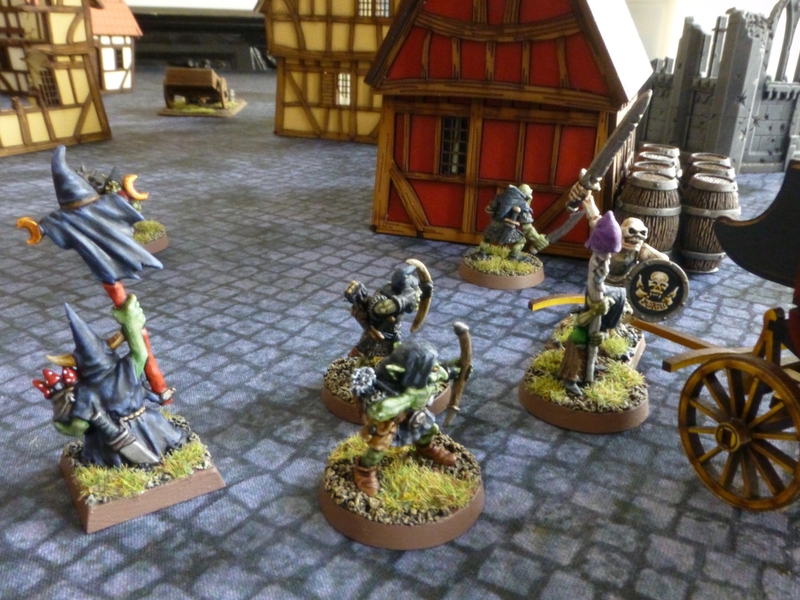 We had our initial clash of arms playing Frostgrave in a Warhammer Old World setting. My mate picked Night Goblins with a Summoner while I took the Undead lead by a Necromancer. Wanting to familiarise ourselves with the core rules, we played a simple scenario with six treasures up for grabs. We also chose our spells without the need for additional templates or figures to represent them, so they were mostly direct damage or buffs. 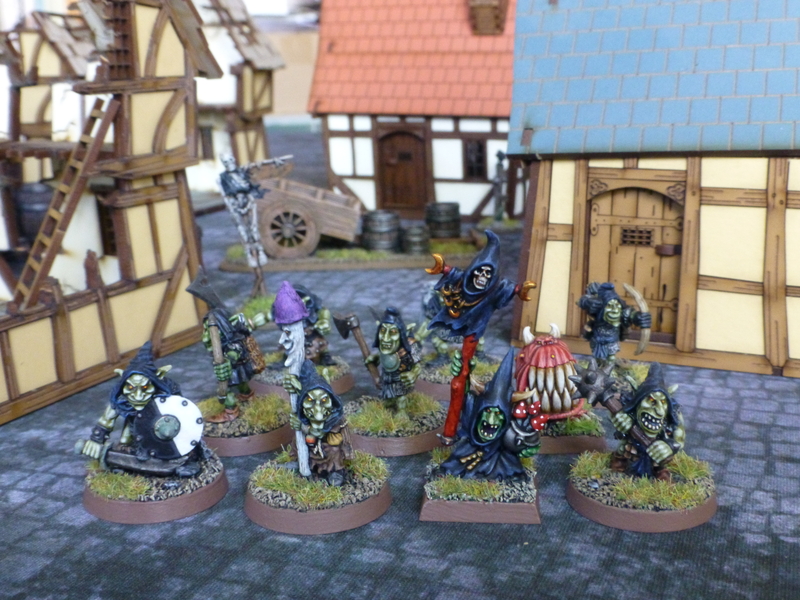 The Night Goblins deployed in a horde in the left corner of the 3×3 table while I split my forces up into a group lead by the wizard and a second with the apprentice. While the Night Goblins initially swarmed over the first treasure pile, I sent my two thugs to search one each and attempt to carry it to safety. 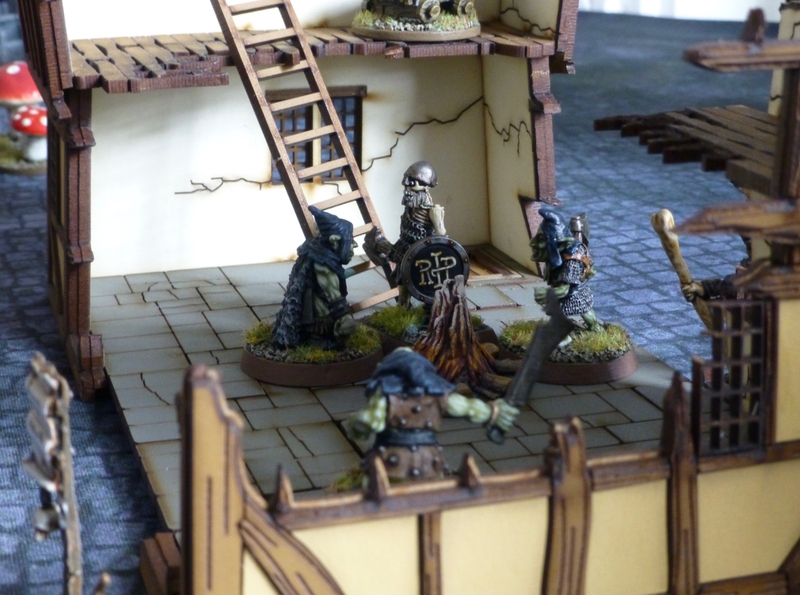 The first major skirmish erupted when a group lead by my apprentice clashed with goblin fighters in a house ruin containing more treasure. With an infantryman dispatched through a fireball from afar and a second being cut down by a lowly goblin thug, I lost this fight and any hope of a win. While one of my thugs escaped with a treasure undisturbed off the Eastern board edge, the second was threatened by the slavering squig. I managed to intercept it at the last moment with a man-at-arms, but failed to kill it. 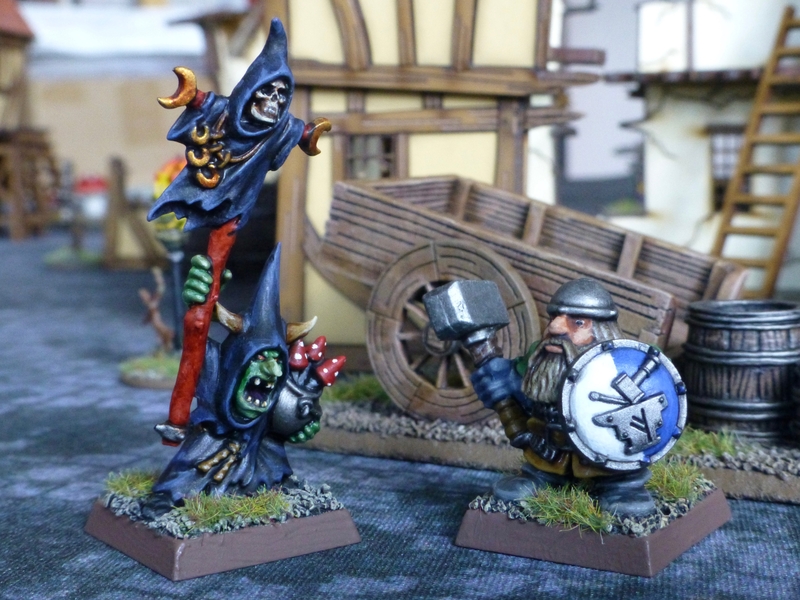 Shortly after, the Night Goblin apprentice blew up its own squig with a fireball, presumably to roast it in preparation for the victory banquet. With just yards to go, my second thuggish zombie was brought down by a flurry of arrows, dropping its treasure token. 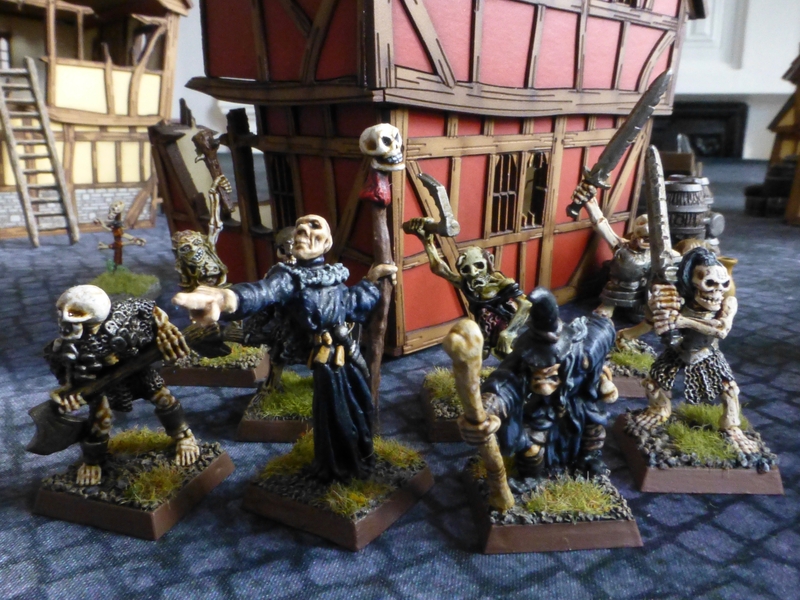 The Night Goblins now had control of the table, and my skeleton’s charge against the apprentice failed to wound him. Shortly after it was smashed to pieces, and my surviving Necromancer decided to slink away into the darkness. With a final treasure score of 5:1 for the Night Goblins and a kill ratio of 6:2, I failed to capitalise on my early gains and positioning. 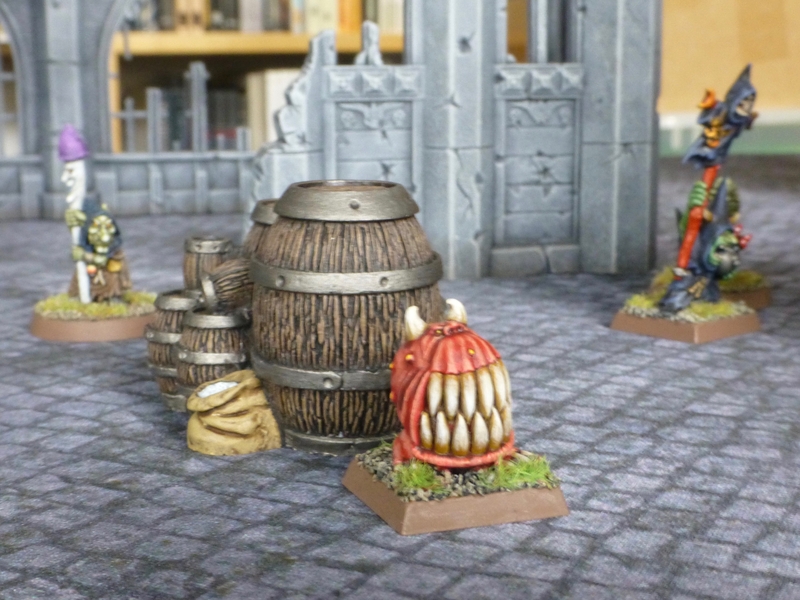 Already being outnumbered, delegating two thugs to treasure carrying duty from the start was probably not a good decision in hindsight, though I very nearly got away with a second treasure while the goblins had secured none thus far. I had expected the main combat to swing my way, but the loss of an infantryman at the last moment through magic and the quick defeat of the second destroyed my main fighting force. 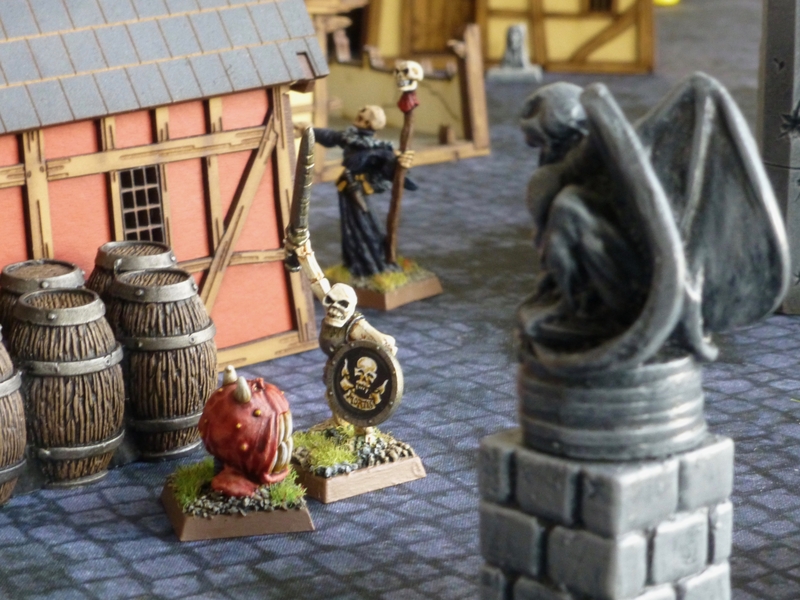 Frostgrave is definitely a very killy system, fittingly reminiscent of Warhammer Fantasy Roleplay. 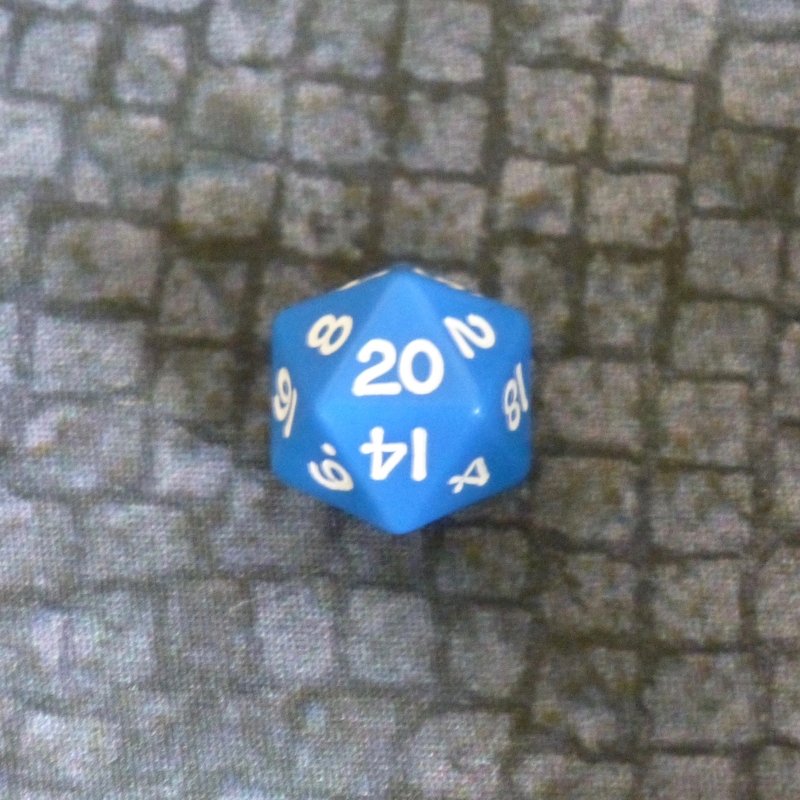 A high attack roll will not only often win the combat but also directly cause a maximum amount of damage, and it is quite possible to lose soldiers through a single strike or spell. Especially with consistent rolls of 20. 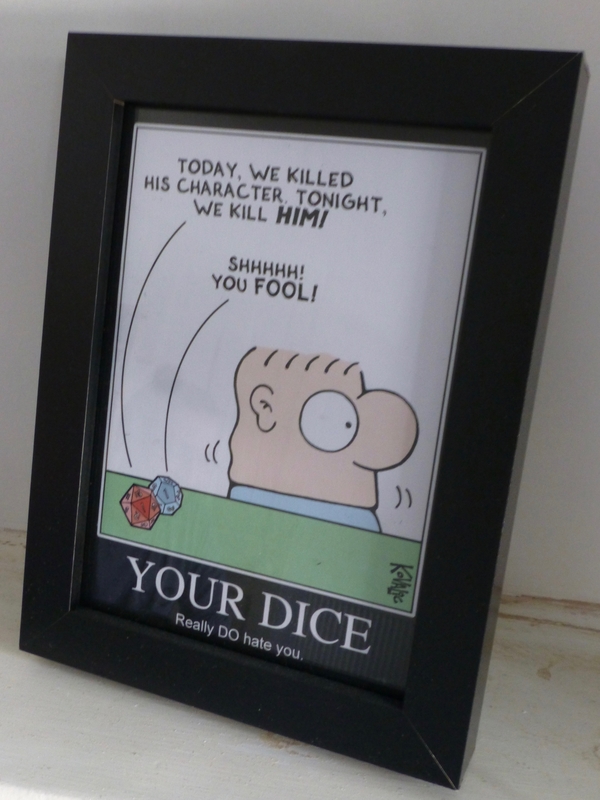 Thanks, blue die of death. 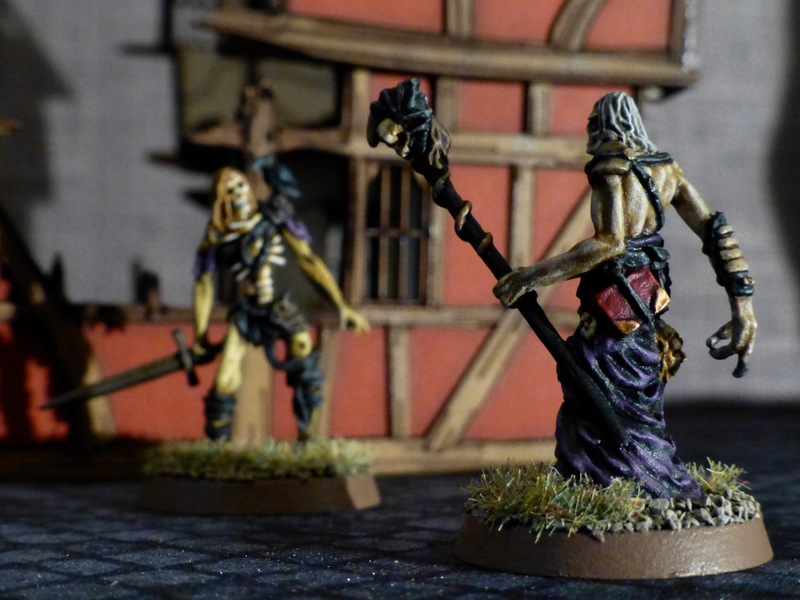 I completed the small coven of necromancer and zombies from the Fantasy and History Kickstarter for Frostgrave (or whichever other fantasy skirmish game the future holds for me). Thanks to Bad Squiddo Games for promoting this campaign which otherwise would have passed by me. 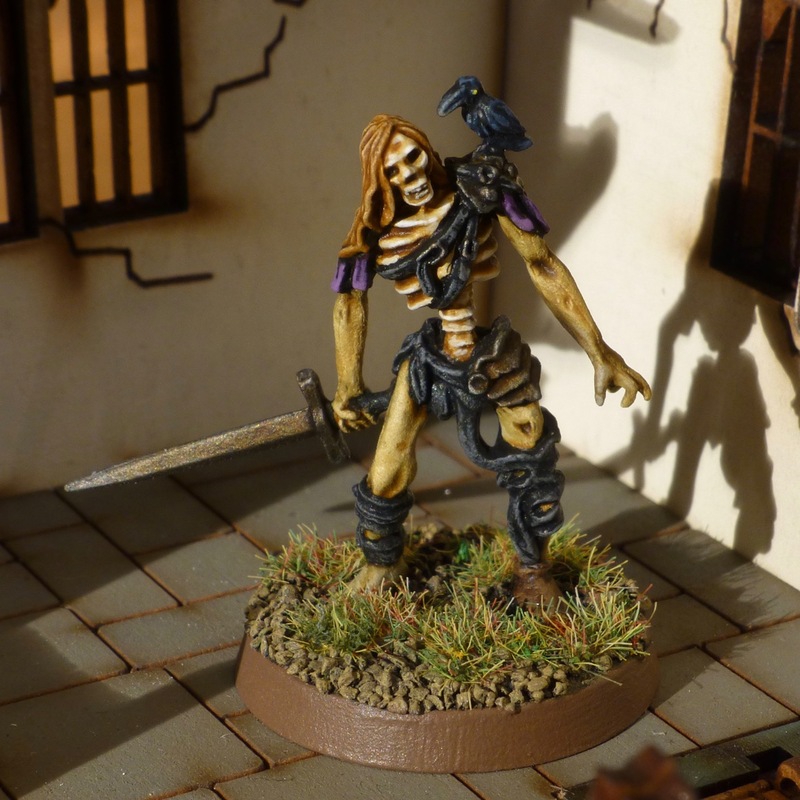 My favourite figure of the lot is this half skeletal zombie with a raven on his shoulder. 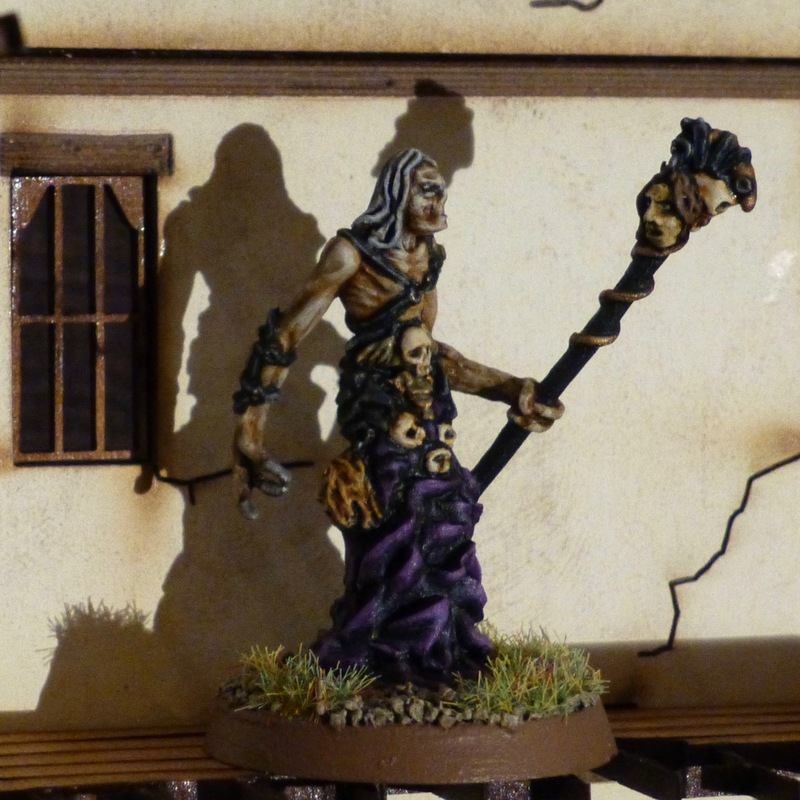 It reminds me of a classic from Citadel that I painted for my Oldhammer Undead. The sculpting quality on this model is very high – I really like the position of the fingers on the left hand and the leaning posture with the large sword dragging behind, as if the wielder still vaguely remembers its use. On the necromancer there were some elements I couldn’t clearly identify, like the top of the staff. Overall he is pleasantly creepy looking though. I believe he is not meant to be a common human, as his hands are three long laws. With this villain and his henchmen finished I’ll probably look into getting a band of adventurers together next to fight through the ruins of a soon to be expanded town. 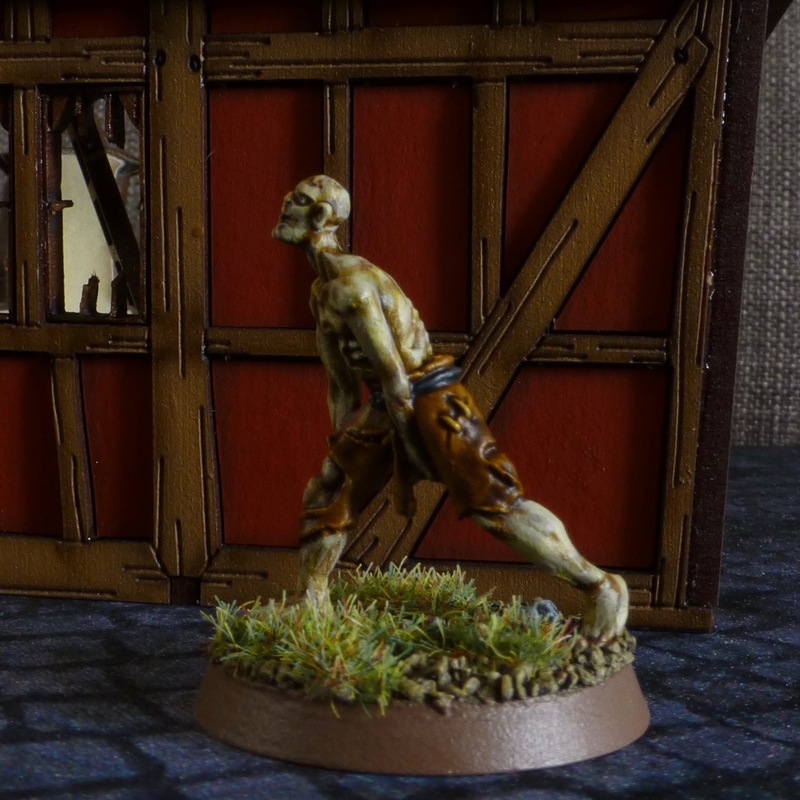 I supported a small Kickstarter project by a German rookie sculptor a few months ago and pledged for the Undead faction (surprise!) 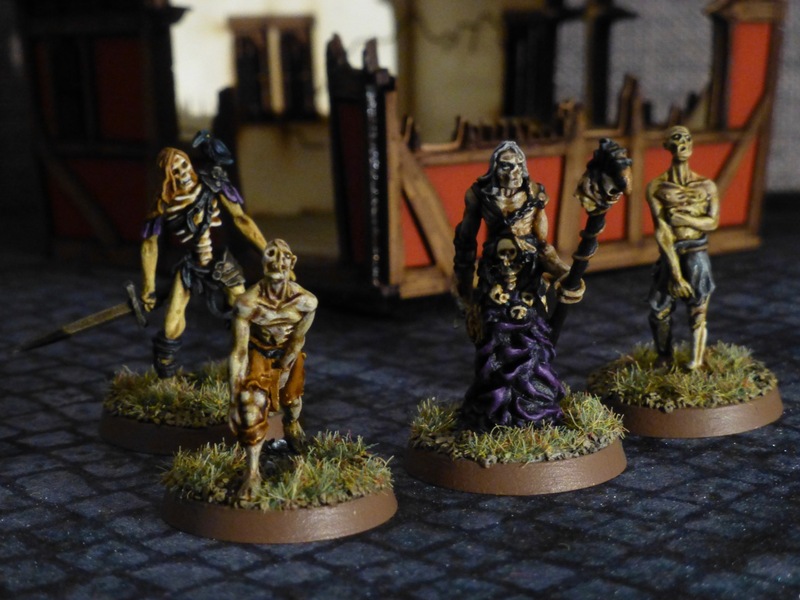 consisting of three zombies, a necromancer, a vampire and a headless horseman. This was the first release under the Fantasy and History label, which I hope will make it off the ground as a new manufacturer and find some distribution. 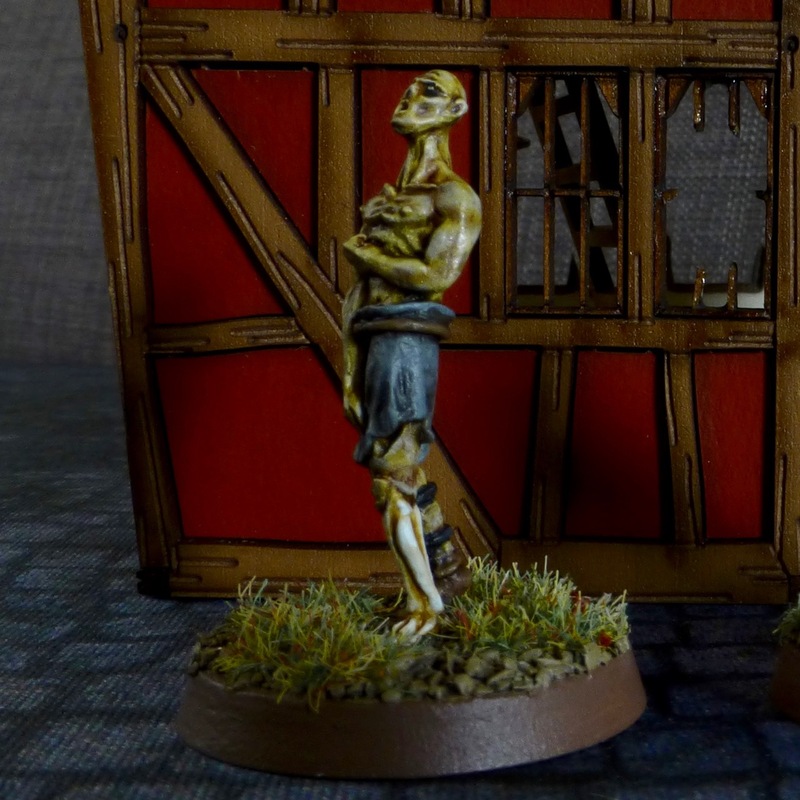 Over the weekend I started painting the models and finished the first two zombies, the simplest of the sculpts. The figures are in a non-heroic scale and nicely proportioned. There are some characterful touches like the half exposed skull and the skeletal lower leg and the poses evoke a suitably shambling walk. 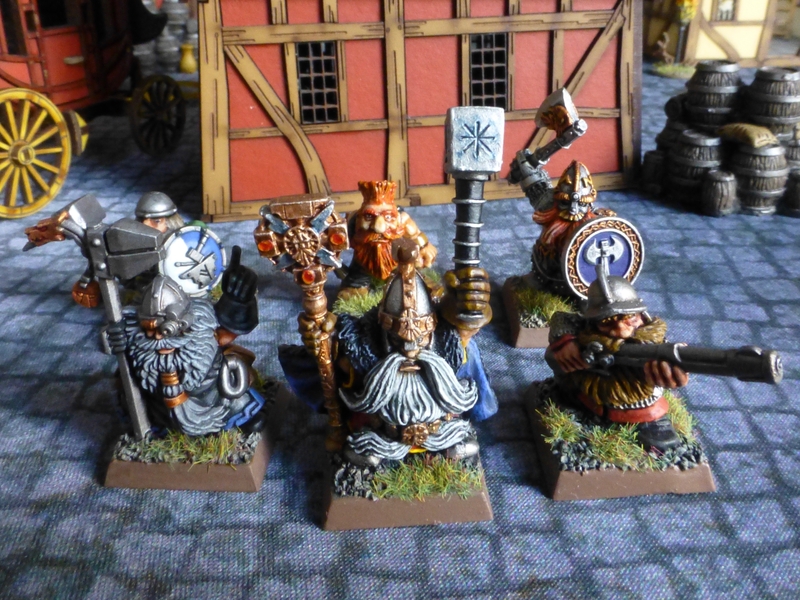 I intend to use them for Frostgrave, which I am casually gathering bits and pieces for without having played the game so far. In the background my first building from 4Ground’s Mordanburg range, which I am totally sold on and will use to build up a small townscape suitable for Frostgrave, Mordheim or as a backdrop for fantasy battles. For the same purpose I bought the 4×4 Cobblestone Battlefield by UrbanMatZ, an equally good purchase.